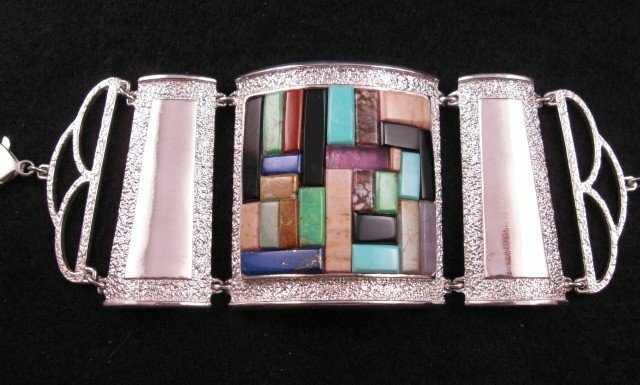 This three piece Hopi sandcast bracelet with Loloma-style multi stone inlay, created by Hopi/Pima artists, Bennard & Frances Dallasvuyaoma, is the showpiece of our Native American jewelry collection. The bracelet is entitled Warrior Woman Bracelet. 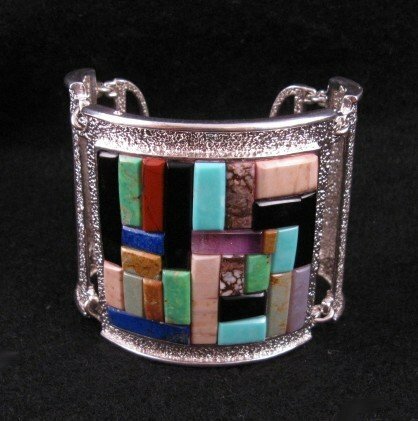 The artists named this bracelet after a Hopi story about the warrior woman and the bracelet is a sterling silver version of her bow guard. 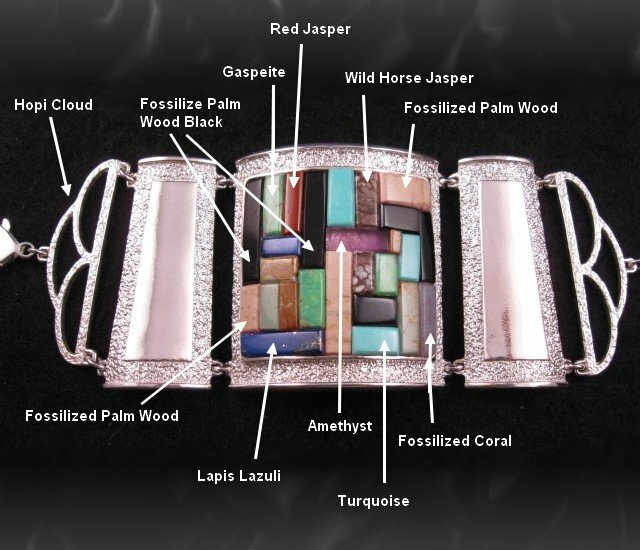 It is inlaid with turquoise, lapis, amethyst, wild horse jasper, fossilized palm wood, fossilized coral, gaspeite, red jasper, and more. 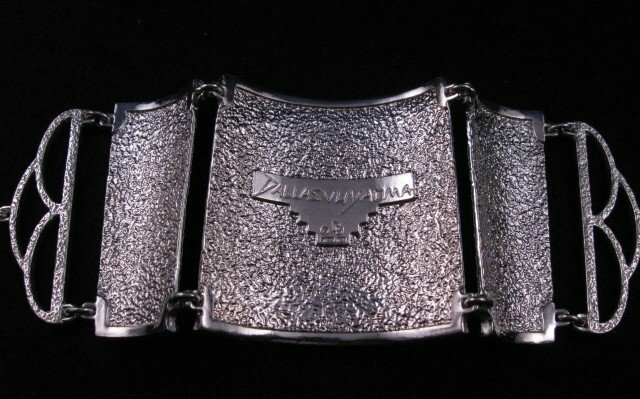 The inlay is raised Loloma-style above the surface of the bracelet. The stones are encased in sterling silver cast in sandstone from Hotevilla on the Third Mesa. The sandstone creates beautiful settings of textured metal which contrasts with the smooth surfaces of the gems. 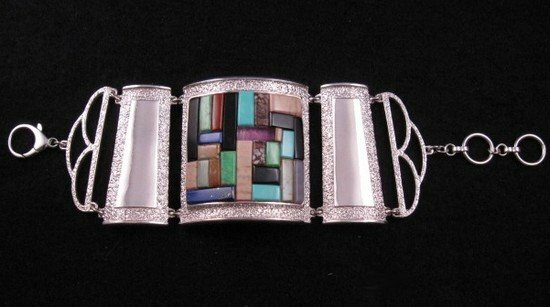 The Hopi cloud designs are on either end of the bracelet. The bracelet measures 2-1/4 wide. 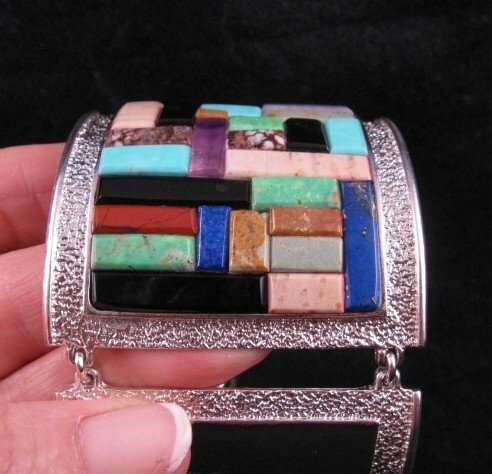 It can fit a 6-to-8-1/2 wrist, but the artists will custom fit this bracelet if needed. It weighs 132 grams. Brand new and in perfect condition! Certificate of Authenticity and gift box included. Purchased in person directly from the artists, Bennard & Frances Dallasvuyaoma. 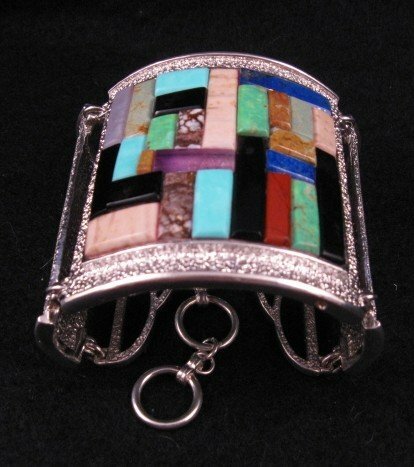 One of a kind handmade bracelet created by two of the Hopi jewelry world's premier artists. This is a One of a Kind, Museum Quality Collector's Piece. 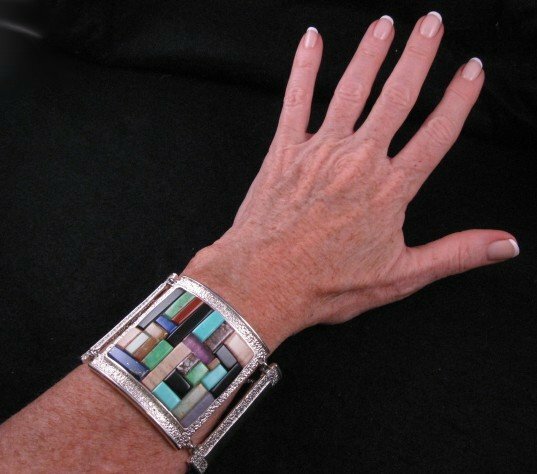 In fact, another version of this bracelet, created by Bennard & Frances, is on display as part of the New Mexico Museum's permanent collection. 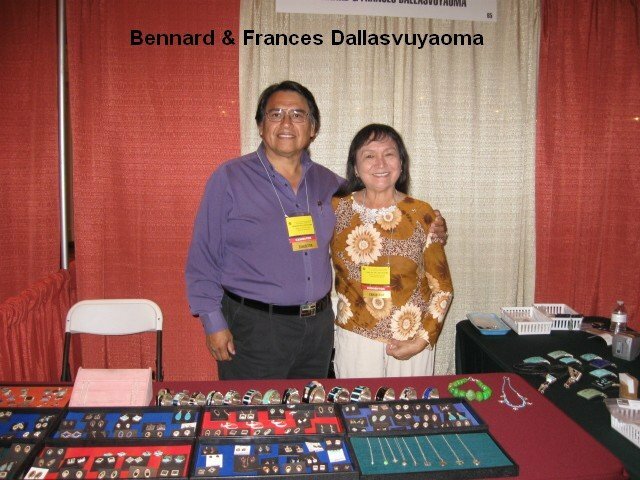 About the artists: Bennard & Frances Dallasvuyaoma are Native American Hopi/Pima Artists from New Mexico. Their innovative jewelry is a dramatic blend of both ancient and contemporary tradi�tions, techniques and materials. Frances is Hopi and Bennard is Pima and Hopi. We design each piece of jewelry to signify balance and harmony, says Bennard. When we talk about balance and harmony, we mean that there is an order to everything and nothing is in disarray. Bennard represents a recent generation of jewelers inspired by Charles Loloma, who was his uncle. You can see Charles Loloma's influence in the style of this bracelet in particular.